CASE Construction Equipment, a brand of CNH Industrial, today inaugurated its first showroom in Faridabad. Spanning across an area of more than 5000 sq. ft., the facility is the first Company Owned, Company Operated showroom in India, offering sales, service and spare parts under one roof. 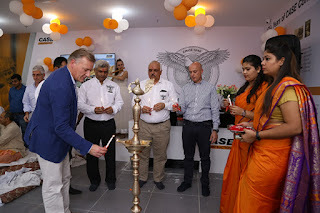 CASE currently has a very strong presence through 71 dealers across India, and with the launch of this showroom in NCR, the company aims to further strengthen its distribution network. On the occasion, CASE showcased its range of 752EX (9T Class) Vibratory Tandem Compactor and 450DX Mini Tandem Compactor (3T Class), Soil Compactor variants of 1107EX (11 T class, available in Standard, Drum Drive and Pad Foot Drum versions), 770 EX PRO, CASE 770 EX Magnum PRO and 851 EX PRO in its loader backhoe segment, 845B and 865B Motor Graders and Crawler Dozers models including, 1650L and 2050M in the 18 T and 20 T class.